Graphtec Design – Is a commercial furniture and signage manufacturer who has been in the market for 18 years, producing for Philip Morris, Nestle, British American Tobacco, Coca-Cola and other multinationals. We conduct business internationally and deliver all over the world including Spain, Portugal, Hungary, South Africa and many others. We started with a loan of $5000 and got to 2,000,000 euro worth of investment to date. 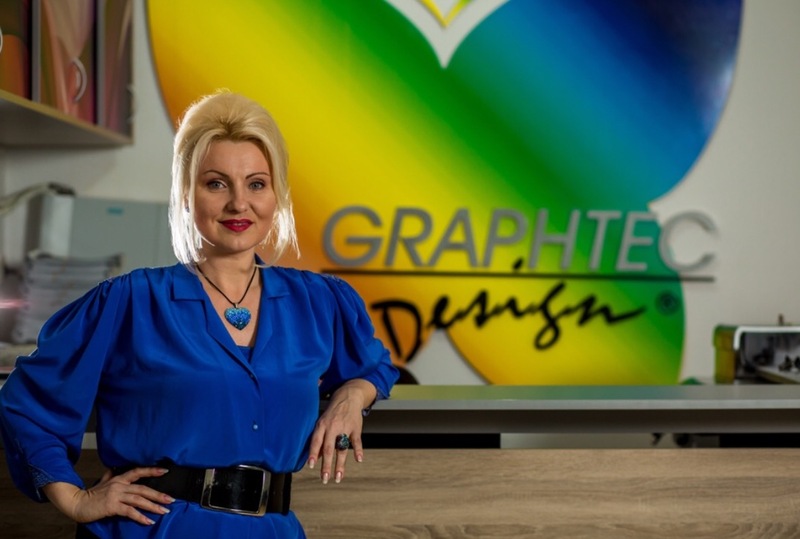 In the last issue of Millionair we interviewed Magda, owner of Graphtec Design and ambassador of women entrepreneurs. We found out about her background and how her company Graphtec Design started. For this issue we decided to ask Magda more about her wonderful team, her journey that got her to this point, their clients, and what differentiates Graphtec Design from other companies. OUR LIFE IS AS BEAUTIFUL AS WE KNOW HOW TO BUILD IT! Our company was founded in 1998 when, while traveling the world, I received a gift from friends very close to my heart – an idea and a $ 5,000 loan for 5 years. Because I had already attempted to build a personal business four times before, up to the age of 24, along with my husband – a wonderful man – and a little boy of only 4 years old, we had a minimal understanding of what a business meant. Thus Graphtec Design was born – now a company with 120 professionals and more than 36,000 atypical products that gives our business a more sustainable identity and visibility and the privilege to be properly positioned in the market. I decided to invest in the quality of the relationship as a responsible person, I like to build relationships and long-term partnerships with discernment and big future plans. I know that the welfare of our business depends on the prosperity and the safety of the families from our company and this gives me the will to go on and also fear. A constructive fear, however, because it forces me to look day by day for solutions for the smooth running of things. A goal of mine is that every Graphtec Design’s employees will be able to have a good life, to offer more to their little children and to have a carefree life. This is what I understand by a high quality life in a family, I see it as a woman, as a mother, as an entrepreneur in this world. I cherish my relationship with my colleagues, with my partners. I encourage them to tell me their problems and I do my best to support them in such a way so they can be committed with all their mind and soul dedicated to the company’s tasks, and to serve together with 100% interest and dedication in our future plan for a better life. Graphtec Design has a large production capacity – this is why we work with multinationals and advertising agencies like – Futurama and Concourse Display Management. In terms of the geographical location of our clients there is no need for limits – we have many clients located in many places around the world and for the future we plan to collaborate with other countries that we haven’t partnered with yet. One of the things that makes us very different to the competition from other countries is the fact that we offer a complete set of services that can help our client to determine which product is best suited to serve their needs. We offer counselling for the design, the technical projection, materials we will use, innovative forms, shapes and colours that will make sure you will stand out of the crowd. Through various consultations we will help you order the product that is best suited to you and help you with the design, production and delivery of it. Graphtec Design gives you Western European quality at Eastern European prices! A vertical market of Graphtec Design is that we can customize any interior furniture, indoor and outdoor signage, any exhibition stand – all you need to portray your company in the best way. All of these products can be found in our brochure linked here. When you look at this brochure, you will see an obviously very happy and close knitted team that has access to comprehensive, state of the art design, print and production facilities making the best out of every moment, every project . In our portfolio we have the best results but also tough situations that have challenged us and made us stronger. Entrepreneurship is a path paved with satisfactions, but behind every success there are the fears that each of us has, losses, surrenders, faltering health. There are a few moments that I want to share with you, because there are those moments in which, at the time, I did not know if I’ll be out of business or if I know how to go forward. Although I had mentors and support from everyone, I did not understand in the beginning how to run a successful company, so I applied an intuitive management that was not related to the term of risk management, neither with any information that the lack of “cash” can cause you bankruptcy, so the first 11 months of activity we had a billion and a half as payment to suppliers and only 250 million receivable from customers, which indicates a slide sure to failure to pay and the end of the fifth business attempt of my life. Only the feeling “that you know you can” may save you, not necessarily that you have any idea how to fix that situation, and this is how I felt that, in fact, this is not the end. If you want to help humanity work more with you and you’ll be a problem less for it! Even if I lead a big company for 18 years and I am part of the life story of hundreds of people, there are a few times when it’s hard for me, too. I recognize my weaknesses and I exceed my limits daily. Yet when I am tired or others insisting to convince me that it is too hard I counteract them with an overwhelming feeling ,my Inner Wish geared towards my big dreams – for a good and qualitative life in this world, where you could feel the happiness in every moment of the day and so, smiling serene you receive love as a gift from all around you! All those who support us in our work are a blessing, many thanks to our supplier partners, our clients and my colleagues, my team that makes everything possible! Graphtec Design supports your projects ! Graphtec Design – 18 years of experience – 36.000 atypical products. Western European quality at Eastern European prices! We dare you to choose Graphtec Design!